The downward facing center spray is in fact the middle of the strip, so you’re only looking at about half of the total width. As graceful as this looks without voiding, with the background fill, it’s far more dramatic. I really like it. I’ve gotten better at the Italian two-sided framed cross stitch. While I had been waxing the last inch of the silk to assist in threading my needle, I’ve found that waxing the entire length really helps avoid splitting. I’ve also learned that the silk is mega-strong, and can take it when I pull firmly. So now my holes are larger and more uniform than when I began. Unfortunately I’ve also learned that this stitch is near impossible to tease out once done, so I won’t be able to go back and replace my “learning bits” stitched when I started. 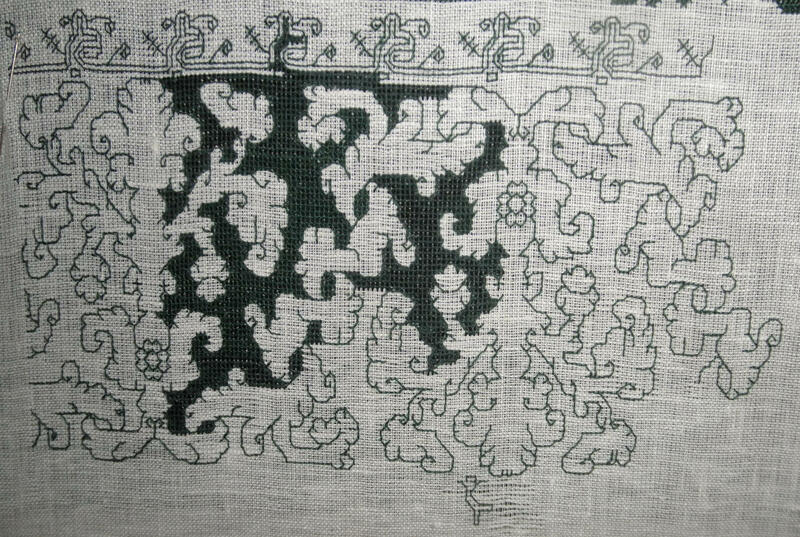 For Susan – I’m using Two Sided Italian Cross Stitch, as shown in Christie’s Samplers and Stitches, 1920. I’m using the version shown in Figure 130, on page 85, but I am pulling it VERY tightly so that it behaves like a drawn thread stitch, compressing and bundling the weave while accentuating the holes. I’m using one strand of Soie d’Alger, color 1846, on a rather loosely woven (approximately) 40 count linen, and stitching with a small eye ball-point needle more commonly used for hand-hemming tricot fabrics. This particular pattern is being worked over 2×2 threads, laying down outlines first in double running, then going back and working the fill. If I had bothered to start and end my double running bits invisibly, this work would be totally identical front and reverse, with no way of telling which side is which. 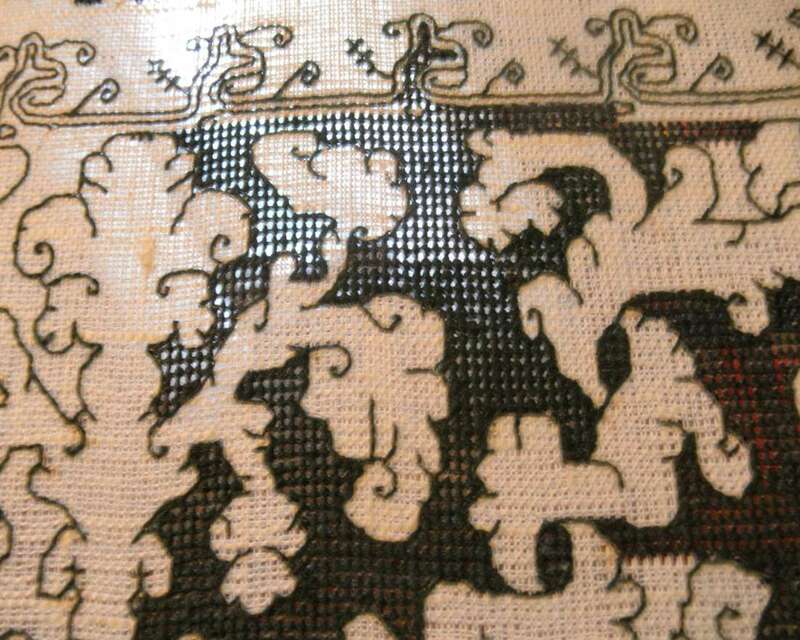 This is why this style was so popular in the 16th and 17th centuries for bed hangings, linens, napkins, cuffs and other items that showed on both sides. Prior to this piece I attempted this look on more standard densely woven modern even weave, with little success. Does waxing the silk thread leave it very dark? I had the impression that this was an issue. Darkening of the color might be a problem with lighter hues, but the super dark green I’m using does not show a difference. But I’m also not waxing heavily – just a quick surface run against my beeswax stick. It looks fabulous. Can’t wait to see it finished! There’s an interesting embroidery project in England I thought you would like to know about. Basically, young embroiderers will be asked to design 6 modern ceremonial dresses that will go on public display during 2012/2013.